To celebrate this wonderful story, The Folio Society have created a superb bound, illustrated edition. 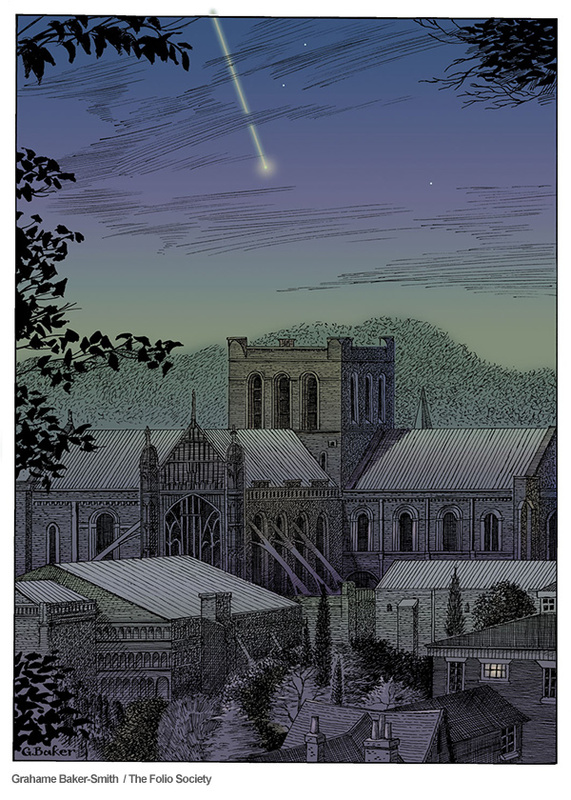 The story is Introduced by noted author Iain Sinclair and illustrated by award winning artist Grahame Baker-Smith. Seven unique colour illustrations have been created that pay tribute to this timeless classic. The book has been bound in buckram and set in in Founder’s Caslon. Narrated in the first-person, it is unusual in that we never learn the name of the main protagonist, who is based in Surrey. We also witness events from unknown protagonist's younger brother who lives in London. It all begins as astronomers see explosions on the surface of Mars, after which a "meteor" lands at Horsell Common, Woking - near the protagonists home. The "meteor" turns out to be a large artificial cylindrical shaped object that has transported Martians to Earth. Those who have never seen a living Martian can scarcely imagine the strange horror of its appearance. The peculiar V-shaped mouth with its pointed upper lip, the absence of brow ridges, the absence of a chin beneath the wedgelike lower lip, the incessant quivering of this mouth, the Gorgon groups of tentacles, the tumultuous breathing of the lungs in a strange atmosphere, the evident heaviness and painfulness of movement due to the greater gravitational energy of the earth—above all, the extraordinary intensity of the immense eyes—were at once vital, intense, inhuman, crippled and monstrous. There was something fungoid in the oily brown skin, something in the clumsy deliberation of the tedious movements unspeakably nasty. Even at this first encounter, this first glimpse, I was overcome with disgust and dread. Our protagonist is one of the first one the scene and as folks gather, one of them waves a white flag to show they come in peace - personally I'm unsure how an alien race would interpret this gesture. Anyway the Martian isn't impressed and begins vapourising people left, right and centre. Things go downhill rapidly for our fellow humans from there. The military gets involved and the Martians realise that things would go better if they walked around in big hulking robot shell tripods with huge heat ray guns. One of the things that really strikes me about this book is the perspective. So many stories go with the macroscopic big view of unfolding events and have a protagonist / group win the day with a clever idea or heroic stunts. In War of the Worlds we get the perspective of seeing a disaster unfold from the everyday bloke on the street. We see and hear what they do. No one's trying to single-handedly save the world but just to survive. We still see humanity at it's best and we see how small and petty we can be. We also see how resiliant we can become and how we can survive things we never thought we would. There are many themes running through the book, arguments on natural selection and evolution tie with a warning about over-valuing intelligence alone. The theme of Religion over Science plays a part - with a rather lunatic clergyman trying in vain to relate the invasion to a religious armageddon. Eventually his loud rantings result in less divine and more Martian intervention. At the same time though we have the protagonist praying to god and thinking that perhaps the bacteria that seals the fate of the martians was left on the planet for just such a reason (proving that there just isn't any way to help some people). It's incredible to think how successfully The War of the Worlds has managed to traverse different media. The 1938 radio play by Orson Wells is almost as famous as the book, especially with the urban myth of causing mass hysteria when first played on the radio. Even more popular is the 1970's musical version "concept" album by Jeff Wayne - which is still going strong today. There have so far been seven films based on the book, including the one in 2004 with Tom Cruise (which was ok, ish), video games, TV series, comic books and even an official sequel by the award winning author Stephen Baxter. 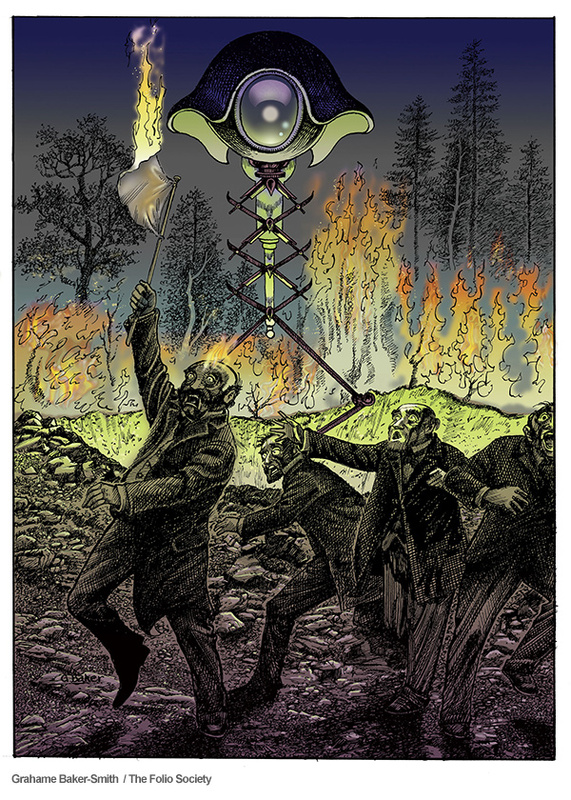 The War of the Worlds remains a well-aged classic and one that in part feels as relevant today as it did over 120 years ago. We still have the religious nutters who see gods work whatever the circumstance and rail against the rise of science. We still have a long way to go before we could consider accepting something so different as an alien without resorting to violence - the argument here that aliens themselves may not have overcome this being a sobering thought. We still haven't removed the shackles of social darwinism in western society - if anything increased commercialism draws those shackles ever closer. 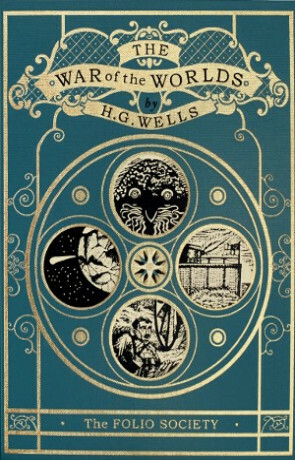 In summary, The War of the Worlds should be part of anyone's collection and The Folio Society edition is the finest example to be found anywhere. Written on 7th August 2017 by Ant.